The millions of Sudanese activists taking on one of the world's most ruthless regimes, forcing two of its leaders from power in a couple of days, say they have started a revolution. Without doubt, the broad social movement which started its campaigning in the hinterland just four months ago has made a series of palpable hits, breaking the mould of opposition politics in the region and beyond. So far, its diverse leadership, including many women and activists from marginalised regions such as Darfur and the Nuba Mountains, has held together. In the weeks ahead, the opposition front will face pressures from residual elements of the old regime determined to weaken it, and from the challenge of maintaining broad consensus about who should run the political transition and what it should do. As many political and security decisions are being taken at the same time, there were reports in the early hours of 15 April of military units trying to disperse protestors in central Khartoum. As mass protests continued across the country, representatives of the forces of the Declaration for Freedom and Change, the broad coalition steering the protests, held substantive meetings with the new junta on 13 and 14 April about the shape of the transition. They set out their demands for civilian technocrats to run the transition, draw up a new constitution and hold elections but with the military and police restricted to maintaining public order and national defence. The determination by the ruling junta to be the sovereign power during the transition is a main sticking point. Some officers are arguing that the military should stay in charge for six months while it pushes through reforms and resolves the factional disputes within the security system. Trust between the broad opposition and military interlocutors is low. Veteran apparatchiks from the regime are likely to try to exploit differences within the opposition between the civic activists and veteran politicians. Before the first round of talks, the new President of the transitional military council, Lieutenant-General Abdel Fattah Abdelrahman Burhan spoke on national TV, announcing the release of all political prisoners and the abandonment of the generally-ignored curfew imposed by his predecessor. Both the rapid shuffling of leadership posts in the junta, as some of the most heinous rights abusers are weeded out, and reversal of its policies point to disarray in the security system. For now, much of the credit for the dizzying pace of change in Sudan must go to the opposition's determination and courage in the face of a regime willing to kill unarmed civilians en masse. Along with the opposition, it was the pressure of the economic crisis on the Sudan Armed Forces and is commanders' fears that the factionalised security system was splitting at the seams. The demonstrators, numbering one million at times, camped outside Alqiyada al Amaah, the military headquarters complex on the northern edge of the airport, have become a symbol of the power of disciplined and peaceful mass protest. They are an autocrat's nightmare. Espousing a cultural as well a political revolution, activists organised food, water and sanitation for the hundreds of thousands lining the streets outside Alqiyada al Amaah. Bands of poets, violinists and drummers wound their way through the crowd keeping up morale. On a grimmer note, the activists run security checkpoints to stop undercover security agents bringing in weapons. Opposition movements have been bludgeoned or co-opted by the security state over three decades. So, the forces of the Declaration of Freedom and Change tried a new organisational and ideological tack. They used the power of community, cultural and trading networks to build a powerful resistance movement, hugely boosted by the commitment of young Sudanese, most of whose lives had been dominated by the absolute rule of President Omer Hassan Ahmed el Beshir and the ruling National Congress Party. Farmers, workers, and traders joined forces with doctors, lawyers and engineers from the Sudan Professionals' Association to push Beshir from power as the economy crashed. It shrank by over 2% last year and inflation was running at 80% at the beginning of the year. Economic mismanagement, grand corruption and the strictures of Islamist rule had stripped the regime of legitimacy in the eyes of Sudanese many years ago. Over the last week, it's become clear that many in the army shared that view. That switch in army sympathies as the opposition massed in Khartoum triggered President Beshir's exit in a palace coup on the night of 10 April. Then it took just another 30 hours for the first leader of the junta, Lt Gen. Awad Mohamed Ahmed Ibn Auf, to stand down after his first faltering press conference in the morning of 11 April. Lt Gen Burhan, the new leader of the transitional military council and a former Chief of the General Staff, is more acceptable to the opposition. Burhan had met some of the activists before the ousting of Beshir and had did not crack down on the officers seen as sympathetic to the opposition in recent weeks. He was one of the few commanding officers who had kept his distance from the Islamist ruling party, initially known as the National Islamic Front, then renamed the National Congress Party. Beshir, a paratrooper, had seized power in June 1989, backed by Hassan el Turabi, a leading Islamist ideologue, and a local affiliate of the Muslim Brotherhood (AC Vol 57 No 6, The power struggle after Hassan el Turabi). Initially, El Turabi and his top supporters were detained so as to disguise the putschists' project. Since then, Beshir and his acolytes have purged most of the secularist senior officers in the military. That could be reversed now that Beshir is gone. Since 11 April, the military council has closed down NCP offices and carted away documents. Some of the top Islamist ideologues, such as former deputy to Beshir, Ali Osman Mohammed Taha and the mercurial Nafi'e Ali Nafi'e, have been detained. Oppositionists are divided over whether such arrests are just diversions or whether a serious purge of the Islamist structures is in train. Burhan's pledge to 'uproot the Beshir regime' won him new friends in the opposition. Outside Khartoum, activists have been attacking offices housing state security cadres and Islamist parties, which have often been interchangeable. Whatever the political direction agreed at the centre, there is likely to be a lot of score-settling across the country after 30 years of militarised Islamist rule. Here, the question is whether Lt Gen Burhan will be a credible mediator between the security and political factions whose rivalry Beshir encouraged as part of his strategy to dominate the regime and marginalise threats. 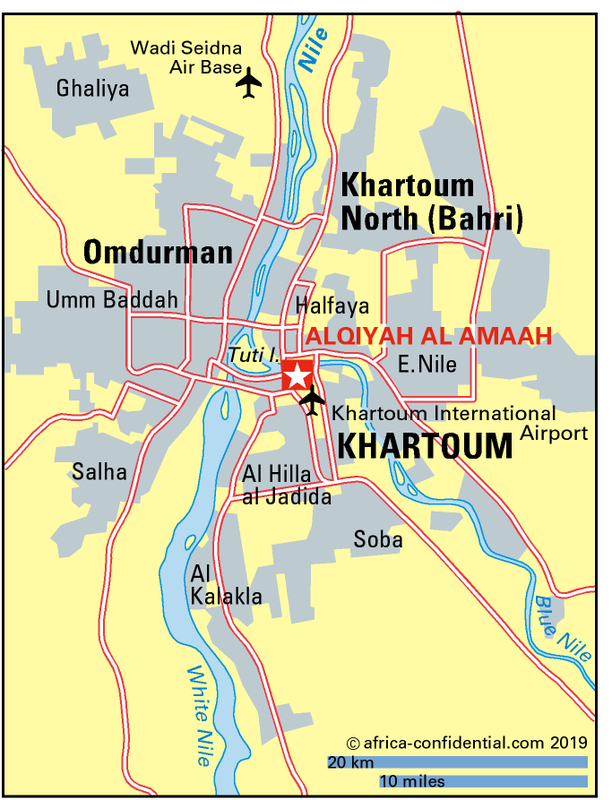 The fight for control covers three main entities: the Sudan Armed Forces, the National Intelligence and Security Service (See Box, In the belly of the security beast), and the Rapid Support Forces, a pro-regime militia drawn from the Janjaweed units used for the mass killings of civilians in Darfur (AC Vol 57 No 20, Did Khartoum cross the line?). If those fights spin out of control, the opposition's agenda for political reform would be the first casualty. Much of the disarray in the military council derives from deep disagreements over the political roadmap. Within hours of seizing power, the junta's plan to hold power for two years, enforce a state of emergency, then hold elections and draw up a new constitution started falling apart. Head of its 'political committee' Lt Gen Omar Zain Al Abidin was rewriting the plan as he addressed journalists in Khartoum on 12 April. Open press conferences are still a novelty. Journalists were surprised to hear Al Abidin say that civil society would sit together to '…come up with the formation of the government' with a mixture of liberalism and stick-waving. 'We will support and protect all the people's demands. But we will respond firmly to any chaos,' he said. Burhan also served as a commander of the 14,000 Sudanese troops fighting for the Saudi-led coalition in Yemen, alongside Saudi and Emirati forces, giving him a direct link with the authorities in Riyadh and Abu Dhabi. Persuading the Gulf monarchies to bail out Sudan's ailing economy again could be key to the regime's survival. However poisonous the rivalries in the security system, it retains a lethal capacity and is a powerful threat to the opposition. The Sudan Physicians' Alliance says 26 people have been killed and 150 wounded in the past week since the demonstrations outside the military HQ in Khartoum started. Police say that another 16 people have been killed in the country's western and eastern provinces, showing the extent of opposition mobilisation. Responsibility for atrocities went right to the top of Beshir's regime and the first incarnation of the military council. Resigning alongside Auf was his deputy, the Military's Joint Chief of Staff, Gen Kamal Abdul Marouf. Early on 13 April, the Director of the National Intelligence and Security Service (NISS), Gen Salah Mohamed Abdallah 'Gosh', also resigned. All three men had called for the security services to shoot at the demonstrators outside the military HQ. However, Mohamed 'Hemeti' Hamdan Daglo, commander of the Rapid Support Forces, was named as Deputy head of the junta under Burhan. A seasoned operator in Sudan's shifting political sands, Hemeti is said to have told his officers 'to stay neutral' once the opposition started its sit-in at the military HQ. He may also be an important ally for Burhan as he tries to face down rivals in the security system. The two men are said to have worked closely on the deployment on Sudanese troops in Yemen. It will take smart tactics and mass mobilisation for the opposition movement to keep a leading role in shaping the political transition. But it is not impossible. That was the track followed in 1985 when mass action had forced Ja'afar Nimeiri's regime from power. After pushing out Nimeiri and his acolytes, the military high command handed day-to-day control to Sudan's civil society and political class (AC Vol 26 No 8, Too many Generals). For more professional military officers – the minority who are unconnected to Islamist formations or harbour personal political ambitions – this offers an opportunity for change. But the path is strewn with political landmines. On the positive side of the ledger is the courage and intelligence of the mass opposition movement which can claim the lion's share of the glory for deposing Beshir. It is also a powerful riposte to sceptics who doubt the capacity of civilians in Sudan to run a state after half a century of military rule. Marginalised and distanced from any national power for the past three decades, Sudan's civil society has kept up an impressive vibrancy and ingenuity in circumventing the strictures of one of the world's most repressive regimes. A photograph of Alaa Salah, a 22-year-old engineering student, dressed in a traditional long white taub, standing on a car leading the crowd in a revolutionary chant, flashed around the world on social media, catching the spirit of the movement. After Ibn Auf surfaced as the junta's leader, people chanted 'We don't want to replace one Kooz [a derogatory term for an Islamist] with another Kooz' on the streets of Khartoum. Ibn Auf is known to have been a strong supporter of the Muslim Brotherhood and the Islamist project in Sudan. In power since June 1989, the NIF-NCP regime is the longest surviving Sunni Islamist regime in the world. It has also notched up the highest body count by any regime in this period, presiding over between 1.3 million and 2.5m deaths in the war with South Sudan, according to experts such as Alex de Waal and Millard Burr. Its military campaigns to Islamicise communities in the Nuba Mountains and repress the rebellion in Darfur took at least a further 500,000 lives. Faki Mahamat made the statement despite direct pressure from Egypt's President Abdel Fattah el Sisi to back off. Hours earlier, Egypt had become the first government to recognise Ibn Auf's junta. In contrast, Nigeria, which sits on the AU's Peace and Security Commission, called on Ibn Auf to organise a speedy return to civilian and constitutional rule. Due to meet over the weekend of 13-14 April, the Peace and Security Commission was set to consider whether Sudan's membership of the AU should be suspended and its military rulers face sanctions under the terms of the organisation's rules against coups d'état. Sisi, who was a classmate of Ibn Auf's at the military academy in Cairo, has taken a close interest in Sudan's crisis. As much as it is unpalatable to Beshir's fellow ideologues and security accomplices, the prospects of a mass democratic movement playing a lead role in Sudan's political transition would be anathema to El Sisi. Those realities underscores the scale of the task confronting the opposition after a week of vertiginous success. Intrinsic to the Islamist regime of President Omer el Beshir, the security structures were the best-resourced arm of the state, having the deepest roots as well as an extensive surveillance network throughout the country and the region. It also spread to countries with substantial Sudanese populations such as Britain, France, Canada and the United States. It will take more than the secularist ambitions of opposition politicians to dislodge it. A determined restructuring and re-professionalisation of the armed forces and security services will be key to any sustainable political change. Gauging the commitment of the military leadership towards such reforms will be a key indicator of the transition's viability. Opposition activists celebrated the exit of Gen Salah Mohamed Abdallah 'Gosh' as Director of the National Intelligence and Security Service after he seemed to have lost a power struggle with Lieutenant General Abdel Fattah Abdelrahman Burhan and Mohamed 'Hemeti' Hamdan Daglo, commander of the Rapid Support Forces. But it won't be the first time that Gosh has fallen from grace in the past 30 years and he could still retain influence as an outsider. There are no reports of his being questioned or detained, far less being held to account for security service abuses. Gosh has been replaced as NISS Director by Gen Abubakar Mustafa, who will also sit on the 10-member Transitional Military Counil alongside Burhan and Hemeti. When Gosh's NISS units fired live ammunition into a crowd numbering over half a million on 7 and 8 April, several junior army officers fired back to protect the demonstrators, and opened the main gates to the compound, allowing tens of thousands to shelter inside. Such clashes between the Sudan Armed Forces and armed intelligence units under Gosh had become more common over the last four months of opposition mobilisation. Gosh, who has ingratiated himself with Western intelligence agencies by giving them surveillance reports on sundry armed Islamist groups working with Khartoum, had been trying to edge out Beshir this year, according to a well-informed regional analyst (AC Vol 60 No 4, Pushing Beshir towards the exit). At the Munich security summit on 15-17 February, Gosh urged his counterparts from Egypt, Saudi Arabia and United Arab Emirates to support a deal to ease Beshir out of office (AC Vol 60 No 5, El Beshir mulls the endgame). Gosh was there with Mohamed Ata, another former Director of NISS, subsequently appointed Sudan's ambassador to Washington, charged with negotiating the lifting of all US sanctions against Khartoum. Ata has now been sacked from his Washington job, and we hear that several more ambassadors, most of them security appointees, are to be retired now. In February, Gosh was reported by Qatar-based Al Jazeera to have met Israeli intelligence officials. Qatar strongly opposes Khartoum's tilt to the conservative Gulf monarchies. The bones of a deal under which Beshir would step down or broker a transition, sideline the Islamist ruling National Congress Party (NCP), then hand power to a military junta, won conditional support from Egypt and the Gulf States. But politics in Sudan has moved on rapidly since then. Cairo and Abu Dhabi have found new interlocutors in Khartoum but few insiders would write Gosh's political obituary just yet. Did Khartoum cross the line? Prepared for Free Article on 25/04/2019 at 19:13. Authorized users may download, save, and print articles for their own use, but may not further disseminate these articles in their electronic form without express written permission from Africa Confidential / Asempa Limited. Contact subscriptions@africa-confidential.com.